@omemanti Yes I will. This is a long thread to catch up ;-), but I did find that the latest revision of the breakout added room for the inductors to use the DCDC mode. I guess it takes some more reading & doing to get the firmware loaded on those Ebyte modules, but as others did that already I'm confident that that will be ok! It will be my first nRF52 application. I'm working on a gesture sensor connected to a Fanstell BT832 via I2C. It is a Sparkfun APDS9960 breakout I have had lying around for a while. Unfortunately I can't get my sketch to compile. It gives 'Wire' was not declared in this scope. Wire.h is included in the library and in the sketch. I'm using MyBoardNRF5 for an NRF52832. Using Arduino 1.8.3 on Windows 10. Which I think is the one that this sketch should be using. Usually I can sort out the compile errors, but this one has me stumped. @nagelc if you turn on "show verbose output during compilation+upload" in File->preferences you should get output telling which library the Arduino IDE has chosen. @mfalkvidd Thanks. The verbose settings show it using the sandeepmistry library. Wire.h works fine when I include it in my sketch. There is something about the way it is called in the Sparkfun library that fails to compile. I'll keep poking at it. Duh . . . Found the problem! It has to be #defined to 1 or more, or the sandeepmistry library doesn't extern Wire. I looked at the SDA and SCL pin definitions in MyBoardNRF5.h, but missed setting the define for how many I2C interfaces were to be used. Change #define WIRE_INTERFACES_COUNT 1. Now it compiles as expected. 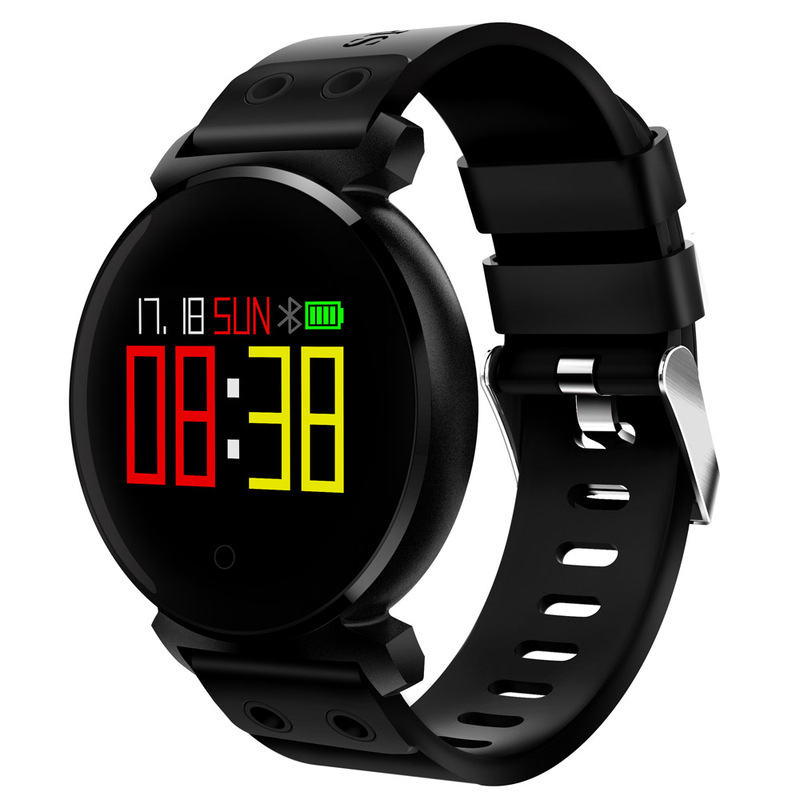 This might be a silly question, but: there there a number of NRF5 smart watches available on Aliexpress, like this one. Would it theoretically be possible to turn that into a MySensors smart watch? If you had access to the programming pins, for example? The last easily openable watches are based on nrf51822, but the good thing is that programming pins are easily accesable and even marked SWD/SCLCK. Search Ali for ID107HR and google for "roger clark smartwatch"
Seems like there is hope then of accessing the screen after all. On http://www.rogerclark.net/arduino-on-the-id100hr-fitness-tracker/ it says: "Display: 0.49 inch OLED display (64×32 pixels) which uses the SSD1306 display controller"
Maybe someone here can figure out how to 3D print their own nRF52832 smart watch? i.e. one that's meant to be taken apart and put back together so that it's as good as new. @neverdie read Issues section in Mark Cooks's repo referenced above. He's just committed a PR to support the display. @toyman Seems like it has a lot of potential as an awesome notifier/remote-control that's conveniently always with you. If you succeed in getting it to work, please do post a photo and let us know! nrf_gpio.h:67: error: #error "Not supported." @korttoma sorry it seems I messed up with the files, this one is not from sdk. @nca78 still not getting anywhere with this. Would you mind ziping your sketch folder, then I should have all the correct files (right?). If I still have issues to compile I must be missing some library or are using the wrong version of something. Sure, but unfortunately I cannot upload a zip file here, please send me your email by private message. or, perhaps a little easier, this one? I'm guessing that a typical jeweler would have the right tools to open it. Maybe get a little help with that part of it? I doubt it would cost much. Fortunately, there seem to be a plethora of different inexpensive nRF52832 watches available. Gobs of them. @toyman Maybe that's enough to light a subset of the pixels on the display? @neverdie I was thinking about that, but that's not gonna work. Why? The bootloader that accepts OTA has a private key. The key in the software should match the key. @toyman Would this work? Buy two. Sacrifice the first so that you can image the firmware on the chip and extract the password. Use that password to unlock the OTA firmware update for the second one. Or, maybe it's the universal bluetooth password: 1234. Maybe try that first. afaik mysensors nrf52 isn't working with softdevice yet (same as your 'bootloader' here). there might be some conflicts with nrf52 resources (timers etc.). so you may need to open it for reprogramming. For me losing Bluetooth would be a feature: it makes you less likely to be tracked while in stores / smart cities. I turned a ST-Link v2 into a Black Magic Probe using this guide. The Black Magic Probe creates two virtual serial ports. One to program over, and another one. Can that second one be used to listen to Serial output from the NRF52? If so, how can that be set up? @alowhum Doesn't answer your question, but I use just regular FTDI to listen to the serial output from the nRF5. So, there's always that for you to fall back on. @alowhum I'm using a BMP that I made from a STM32 Blue Pill. The Serial works just fine. Set a TX pin on your NRF5 in the MyBoardNFR5.h file. Connect it to the RX pin on your BMP. The default pins are TX (PA.2) and RX (PA.3). So if you connect PA.3 on your programmer to the TX pin you select on the NRF5, you should have what you need. To program, select the lower number serial port. To see serial output, select the higher number serial port for your serial monitor. So you suppose any of these two pins are now RX? @toyman Looks like a DIY watch, using one of the very small nRF52 modules and a small OLED screen (or maybe ePaper?) would be fairly easy to design and put together. Making it aesthetically pleasing is probably much harder! Still, maybe a DIY bridge would tide you over until a more proper watch is available for conversion. Interestingly, it looks like they made their case from stacked pieces of laser cut acrylic. @alowhum Reset seems unlikely. Maybe SWIM. You could try it. If you can follow the trace back to the microprocessor, then you could figure out which pin it is. Then you could change to that pin in the BMP files, recompile, reload . . .. . Not sure it's worth all that experimentation when you can just use an FTDI as @NeverDie does. @alowhum just buy a real Blue Pill (around $2) and convert it into BMP. Thank you for this idea, I didn't receive my STM32 (got lost somewhere in transit) but I have 2 unused blue pills, I'll try that tomorrow. Is the main (only?) advantage of the BMP that you have a single USB connection from your PC to your project instead of two (e.g. J-link plus an FTDI)? Or is there more to it that that? @nca78 I used exactly this guide. Works like a charm. @nca78 I have now measured the current consumption of the small bluetooth beacon device (N51822 QFABC0) using your code and the results are encouraging. Measurements done with an Micro (nano) ampere meter (double) that has not been calibrated against a reliable meter so do not take the measured values so seriously but more as a comparison. @korttoma I was going to ask you for some news. This is great news as it confirms the problem is solved even with older versions of the chip. PS: I think you will have a reliable measurement with a simple multimeter, as the nrf51 by default is using an internal LDO, whether you feed it with 3.3V or (3.3V - burden voltage) in the end the chip will run at the same 1.8V voltage and use the same current. Of course it won't be the case if you have extra sensors on the board but it's not the case here. I see a lot of nice assembled PCB's on this forum, and just out of curiosity, but do you guys do your own SMT assembly? I looked at the PCBA options, but just a small batch of 10 PCB's starts somewhere around $140 excluding components. My ebyte modules & STM32 programmers are on there way from AliExpress, so no problem in that area. @mars-warrior it depends on quantities of both PCBs and components on the PCBs. If you have lets say 10 pcbs with 20 components and potentially will have to do it again, the best bet is get a small oven (kitchen type) with PID regulator. If you just need 2-3 pcbs with 5-6 componets, hot air gun is your choice. In my current project, I solder ebyte module by hand (very easy) and then LED, resisttors and capacitors with hot air and solder paste. @toyman Thanx for that info! Never worked (yet) with a hot air station/pencil. Of course, any recomendations about hot air stations are appreciated! @gohan I am not telling you to buy this. Just a direction. I've created a PID sous vide machine. It's relatively easy project. SMD oven is absolutely the same. All you need is Arduino, thermoprobe and a relay. Should I select "reset enable or not? What does that do exactly? Should I select clock: "Crystal oscillator" for the eByte module? @alowhum "Reset enable" determines whether pin21 acts as a reset pin or not. @alowhum IIRC, the crystal oscillator is only required by Bluetooth. For everything else, the internal resonator is sufficient. I received two new eByte modules. I can't even connect to either one, both with BMP or ST-Link V2. Very strange. I'm going to try not powering them from the USB stick but from a second 3.3v source. @alowhum did you manage to flash them? @toyman No. I don't understand what's going on, as I was able to flash one succesfully before. I did find [this a bit unnerving].(https://devzone.nordicsemi.com/f/nordic-q-a/19943/nrf52832-unable-to-connect-to-the-target). Could it be that the EByte chips need the DCDC stuff before they can be connected to? Or that the exact moment on power-on (reset) matters? One thing I have found is that I had installed OpenOCD on my laptop to turn a ST-Link V2 into a Black Magic Probe. That version of OpenOCD was overruling the hacked version that Sandeep Mistry had created for the NRF5. "TARGET: nrf52.cpu - Not halted". Apparently this is a sign that the chips are protected. I was able to remove that protection before (by selecting "Burn Bootloader"), but it doesn't work now. Could it be that the EByte chips need the DCDC stuff before they can be connected to? @alowhum have you tried the menu item to write softdevice ? If I remember well it will unlock the chip and after that you will be allowed to write code to it. somehow I cant change the pins on my Ebyte module. Im trying to test with MockMysensors. but somehow the TX pin stays P0.25. The node connects to the gateway, so thats also working. Seems like that if you put the MyBoardNRF5 files into the example map and you change some things in that file using the Arduino IDE, it doenst get uploaded. When I changed the MyBoardNRF5 file using Brackets it working as intended. I've been playing with OpenOCD and the ST-Link v2. The ST-Link V2 that I turned into a Black Magic Probe doesn't see the modules. Now I could manually issue some OpenOCD commands. The goal was to do a manual mass erase. This command actually resulted in OpenOCD ballooning to 8Gb in ram. Then after 5 minutes of seemingly being busy, I got the 'target not halted' command. Here is says "target not protected". Weird: the processor says it is in reset state? Could it be that it is not so much protected, but that it is constantly being reset? But then why is this with all the chips? But then I get "Error: attempted 'gdb' connection rejected"
All members of the nRF51 microcontroller families from Nordic Semiconductor include internal flash and use ARM Cortex-M0 core. Also, the nRF52832 microcontroller from Nordic Semiconductor, which include internal flash and use an ARM Cortex-M4F core. Erases the contents of the code memory and user information configuration registers as well. It must be noted that this command works only for chips that do not have factory pre-programmed region 0 code. I also got out my voltmeter. Pin 21 and pin 25 have 3v on them, the rest don't. I have the same problem with brand news ebyte modeules. @alowhum I'm not in sync with the whole thread , but I had similar issues when I had an FTDI adapter connected with @NeverDie 's breakout. As soon as I disconnected the DTR (reset) line the thing started to work! Not sure if this is related to your issue, but it's worth a try. @alowhum I intentionally asked you because I know the problem exists. Is there a way to enhance the sending performance of the Ebyte units? I got a gateway that's sitting upstairs when I connect an Ebyte module I must be right underneath the gateway to let it receive packages. When I do exactly the same same thing with an NRF52832-DK It doesn't matter where I'm standing, every message is received by the gateway. @omemanti Maybe by using a properly tuned external antenna? At least for the built-in antenna's, the Fanstel modules seem to have more effective Tx reach than the Ebyte modules do. That's a major reason for my switch from the Ebyte's to the Fanstel's. @omemanti Ah, that makes sense. That's why on my PCB's I have the antenna portion of the module hanging over the edge of the PCB into empty space. yeah, next one will be a big hole in the middle, lets see how that will work out..
For example here is an extract of the Fanstel BT832 module datasheet. It's not the same antenna design but it show having the antenna sticking out is the best solution, else you should but as close as possible to the edge and of course keep ground plane and traces as far as possible. @nca78 I'm trying to create a node that fits inside a standard wallsocket. (I'll post it when it's done) it got a motion and moisture sensor. For the next version I'm moving the module more to the outside but I need to take the screwholes into account. The groundplane I used filled the entire PCB, next one will have less ground around the antenna or even holes. It's designed to hold 3 AA batteries to have a couple years of service. Hi I managed to clear the access protection. I connected ebyte module directly to raspberry pi. I tried also with st-link but I think it doesn't support dap commands? Can anyone confirm that? After clearing access protection I am able to successfully flash chip with st-link. (same with just "dap", which I had tried earlier). @omemanti That PIR sensor lens sure has a small footprint. I'll be interested to hear how well it performs and whether you like it or not. @neverdie it's the AM612, and in the little tests I did so far, it did great. @maciekczwa If you could share a guide to unlocking these devices, I would be very grateful. I'm have a bit of trouble still. I create an JLink device form an STM32. But even that gives the same general error on all my modules. ERROR: Semiconductor and provide the generated log.log file to them. I tried lots of DLL versions, and a new version of nrfjprog.. no luck. JLinkARM.dll CORESIGHT_WriteAPDPReg returned error -1. JLinkARM.dll CORESIGHT_WriteAPDPReg returned error -102. Furthermore, It would be nice to have a small step-by-step guide to unlock and then program the ebyte module. For uploading code onto the Ebyte modules I use an ST-Link V2 (2 dollar USB modules). Connect the DIO, CLK VCC, and GND. For testing purposes, I soldered just the tips of some Dupont cables to the Ebyte module and put the female parts on the ST-link. This will give an error. After that, you should be able to upload sketches. That's what I suggested earlier but it seems it didn't work. But I don't remember if it was with an stlink. maybe a very stupid question, but did you check all the wires and after that if your computer uses the right drivers. I took me quite a while to figure this out myself. Especially the driver part messes things up. Errors everywhere that referred to different problems, but after I used Zadig they all disappeared. As I've said many times previoiusly, I use the nRF52 DK to program external modules, and it's what I recommend for noobs because it's relatively hassle free. If you're able to use the $2 st-link v2 programmer then great, my hat's off to you. If not, I recommend the nRF52 DK rather than get frustrated and give up. Which hardware programmer do you use with that? I find many of these software packages, like Segger's JLink stuff, are made for Windows (I'm on a mac). @Omemanti I didn't realise the nRF52-DK was a hardware device. I thought it was a software program. On the picture you provided (thanks! ), are pin 6 and 8 connected to a serial port to read what's going on? Your ground is connected in a different place than mine (I connect it next to the VCC pin). I suspect both those side-pins near the antenna, at the top, where you have soldered something, are ground too, right? select J-link and there you go. On the picture you provided (thanks! ), are pin 6 and 8 connected to a serial port to read what's going on? I used Pin 6 and 8 to connect to a FTDI to read out the serial. Since you can tell the sketch where to put the RX and TX I just connected them to 6 & 8. Your ground is connected in a different place than mine (I connect it next to the VCC pin). I suspect both those side-pins near the antenna, at the top, where you have soldered something, are ground too, right? WARNING: RESET (pin 15) high, but should be low. Please check target hardware. I already had some signs these EByte modules have a reset issue. As it they are constantly being reset. This points to that again. hmm. Hey, sorry, I'm not familiar with your error messages. Looks like HolyIOT is ahead of the curve on this chip. If you buy one, buy the "black" version, it's a bit bigger but it's because it has a PCB antenna, range will be better. @nca78 I don't recognize any LDO on the PCB while it has USB power supply. How is 5V converted to 3.3v? I was wondering the exact same thing! Look at bottom of page 6 and top left of "schematic" on page 9 of the CP2104 datasheet. It can supply up to 100mA. Can someone please provide a link to the module being discussed? I tried looking on Aliexpress, and I don't see anything which matches. 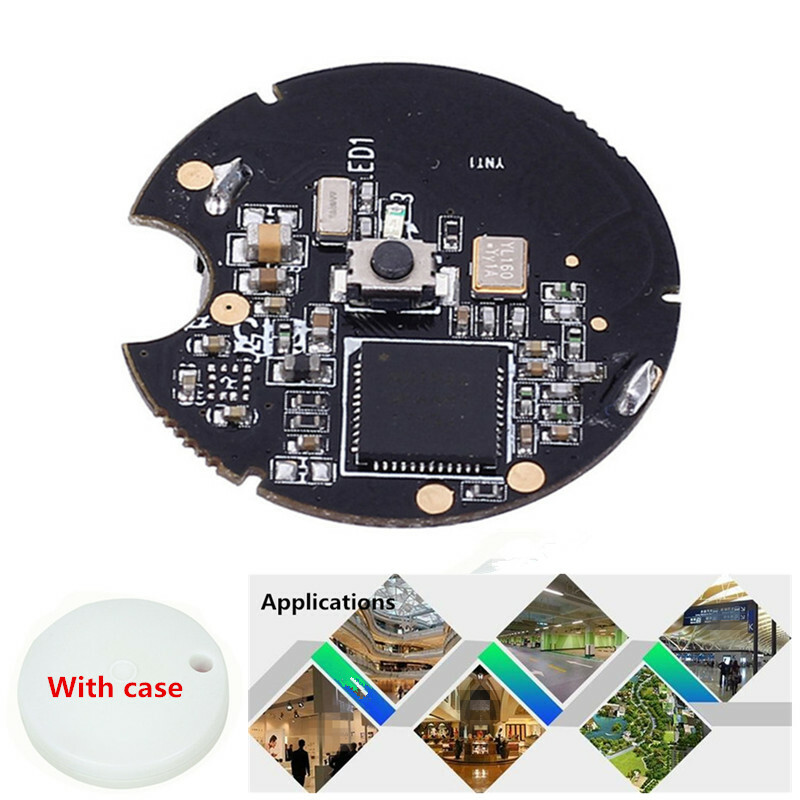 @neverdie it's this link, in the description on aliexpress you can see the internal PCB "module"
@nca78 Got it. So it's kinda Arduino Nano, but nrf52-based.